I smiled happily to myself as I walked through the quiet halls. We had just returned and I changed back into my uniform, incase His Majesty saw me. I held the bag with my gifts in it tight to my chest. I walked to the room I shared with Juvia to find her playing on the piano we had. "Welcome back Levy, did you have fun?" she smiled. "Oh Juvia it was wonderful!" I couldn&apos;t help the wide grin plaster on my face. I set the bag down and pulled out the purple dress Gajeel got me. I held it to my chest as I twirled around. "That is beautiful Levy!" I smiled as she walked up to me. "Are you gonna wear that to the ball?" She asked. I frowned a little. "I would like to but... 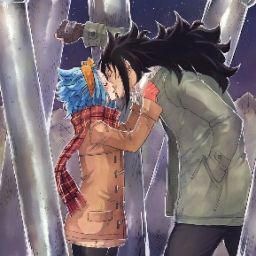 If Gajeel doesn&apos;t ask me then I will just work it again." Juvia shook her head. "No, you have worked every year since you&apos;ve been here. I know Mira-sama will be more than happy to give you the night off!" I smiled at her and looked down at the dress. "I guess I can go." I grinned as she hugged me. "We can both go! Maybe Juvia can ask Grey-sama!" We laughed and Juvia pulled me to the closet so we could pick a dress for her. When we had finally picked a long black gown that a split up to her hip and was sleeveless we both sat at the window seat. I smiled happily out the window. "Juvia has never seen you so happy." "Iv never felt this happy. Gajeel just makes me feel so... I don&apos;t even know the words..." Juvia smiled at me. "Maybe your in love." "Love?" she nodded. I thought about it before smiling. "Maybe I am." The light shining threw my window woke me. I stretched and groaned. Today was gonna be a long day. I worked my way to the dining hall where dozens of servants waited patiently. I groaned inwardly. I didn&apos;t wait for Grey before getting started. After about an hour he showed up and started next to me. We made good headway an by lunch more than half of them were done. Levy and Juvia showed up with treys of food. "Lunch time guys!" Levy said with a smile. She was wearing the head band I got her yesterday. I smiled and turned to her. She set the trey on the table and I started to eat. "Juvia and I have a question for you guys. "I looked up at her. "Shoot." "Uh would you join Levy and Juvia... At the ball in three days?" Juvia stuttered. Grey flushed and I smiled. "I will be happy to go." I said. I was not a dancer, but for Levy I would. Grey just nodded. The girls smiled. "Its a masquerade so don&apos;t forget to get masks. Unless you want us to get them?" I thought for a minute. "Why don&apos;t Grey and I make the masks?" Levy grinned and clapped." That would be amazing!" Juvia twiddled her fingers and whispered,"A gift from Grey-sama?" I tried not to laugh. "Grey can make his and Juvias. I will work on ours." I told Levy. She smiled widely. "That&apos;s great! We have to go, don&apos;t work to hard!" they left. Grey and I finished eating and I got back to work. We finished before sunset and ate dinner in silence. Afterwards I headed to my room to get the supplies for our masks. I made my way out to the garden and for once I beat Levy. I sat beneath the tree and started molding the light weight clay. I was so focused on it I didn&apos;t notice someone sit next to me until I felt a head on my shoulder. "There you are." I said with a smile. She smiled and looked at the clay in my hands. "Is that mine?" I nodded. She thought for a moment. "I want to make yours." She grabbed a handful of clay and started to shape it. We worked together in silence. "So how will we bake these? Will you have time to run to the shop." I shook my head. "This is a special sun bake clay. When your done just make sure it sits in the sun for a few hours. Once it&apos;s hard it&apos;s ready to paint." She nodded and smiled up at me. After a few hours we parted ways and I headed to bed. I set her now shaped mask in the window. I had sculpted wings on the side that would flair out around her hair. There were soft spirals carved into it and edges were trimmed in clay spheres the size of pearls. When I paint it I decided to paint the spheres like pearls in a soft white. The base I would do a soft pink color with purple tints. The spirals would be outlined in white. I was about to lay in bed when someone knocked on my door. I opened it to find Natsu grinning like an idiot. "What?" He looked ready to burst. "Its a girl!" he yelled and gave me a quick hug. It took me a minute to figure out what he was talking about. "So Lucy finally made it! Congrats man!" We grinned at each other. "Her name is Nikida. She&apos;s got my hair too." I smiled and clapped him on his shoulder. "Good for you man." he smiled again. He went to leave but the stopped. "I almost forgot the actual reason I came by!" He turned back around. "Eh?" "I won&apos;t be able to keep breaking the dolls." he scratched his head. "Why not?" "They&apos;re on to me. They run whenever I come around the corner." he grinned sheepishly. "What did you do to them? Throw them down the stairs?" "Well..." I smacked my forehead." Dear god you are...."
He grinned a little. "They are really hard to catch! I don&apos;t know how they run so fast!" I groaned. This man was gonna be the death of me. Chaos I causes should keep you here for a few days at least." "Do I want to know?" He shook his head and I groaned.